When to fish for big Walleye? Walleye fishing at Silsby and the outpost lakes is great during the spring, summer and fall. 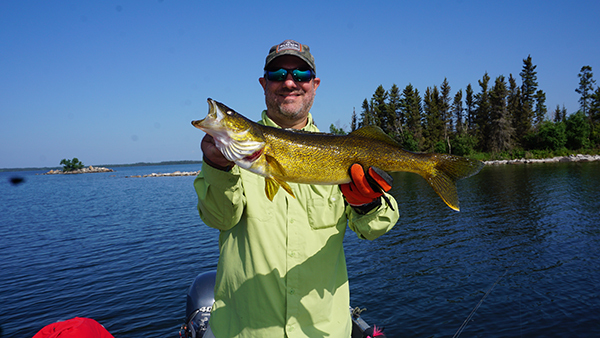 These lakes are different than many good Walleye lakes in that the depth does not exceed 60 ft. All three lakes produce good Walleye fishing in 3-30 ft. of water throughout the season. Below we give you a basic description of what to expect during both times. Whether you choose the spring or the summer we are sure our trophy pike will create exciting memories. "Family vacation to Silsby Lake Lodge - Manitoba. I was a little nervous taking my wife and two daughters to a remote fly in fishing lodge, but what a great adventure it was. We caught a lot of fish and had shore lunch every day. Weather wasn't perfect but we did have a great time! Vicki got her first master angler northern 41 1/2, Sierra 41 1/2, Craig 41, Kassidy had a big one to the boat and lost it. I am really glad we did this! Thanks Sam." Craig Wendt (below) with big Walleye from Silsby in mid June. Ice-out varies from May 15th to June1st with the average being May 20th. Due to cold fronts that come in and out of the area, temperatures can range from 35 - 80 degrees, so bring layers of clothing. On all three lakes, Walleye are in 3-6 ft. of water and at the mouths of the many rivers and creeks. Bring 1/4 - 3/8 oz. jigs in white and yellow for all the walleyes you desire. On High Hill and Cuddle Lake there are multiple sets of rapids for the fishermen who like the adventure of fishing the pools that these flowing rivers produce. 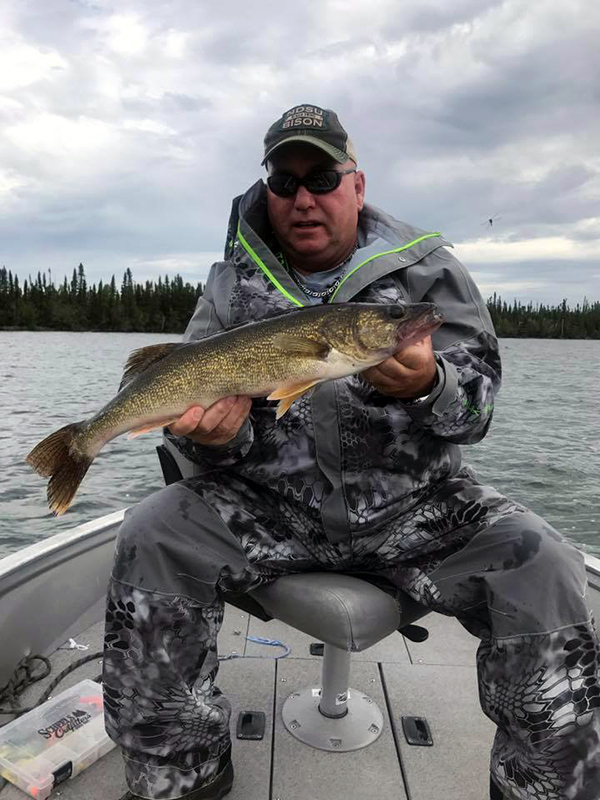 Kent Nastasi (below) with another big Walleye from Silsby in late July 2018. This time of year the weather is more stable. Fishing becomes more consistent with temperatures averaging 50 - 80 degrees. There are fewer cold fronts thus fish are less affected by the weather. This far North, the water stays cool so there are no mythical "dog days" in July and August. Walleye are 10-30 feet deep and in the weeds, around reefs or points and caught easily with jigs and twister tails along with crank baits. They will also attack your traditional pike baits.